Wednesday, May 13th, promises to be one of the famous days of the year for the University and the United Daughters of the Confederacy. On that day, the U.D.C. monument on the University campus is to be dedicated and a number of old soldiers who fought in the Confederate army in the days of 61-65 are to receive diplomas from the University. Dr. Denny, in an address to the students some days ago, said that Confederate veterans would come to the University of Alabama for that occasion from the Atlantic seaboard to Mexico. He emphasized the fact that the day would be one of unusual interest to all those who were in any way related to the University or the Confederate cause. He announced that there would be a meeting of the University assembly on the afternoon of the delivery of the diplomas to the veterans, and that all students of the university would be present. Tuscaloosa, too, is making elaborate preparations for the entertainment of the numerous visitors who will be guests of the city on that occasion. Already a list of delegates has been published in the Tuscaloosa newspapers and hosts have been assigned to the delegates. The University of Alabama and Tuscaloosa will combine to do all possible honor to the distinguished organization which has so signally honored them. The University takes great pleasure in the part which it is playing in the work of the United Daughters of the Confederacy. Source: “U.D.C. Monument to Be Dedicated in May,” The Crimson White, May 6, 1914, 1. This week, Morgan Hall, the new academic building is receiving another coating of calsomine, preparatory to the commencement celebrations. The walls are being change to a rich brown color, lighter, and more artistic in appearance than the former pink, and the overhead and all above the molding is being transformed into a pleasing yellow. All the halls down stairs and the vestibules have been renewed; and the entire building is to receive a new coating. The woodwork inside the auditorium is being retouched and the walls will be repainted. The building as a whole is being greatly improved in appearance. The Alva Woods memorial tablet which was in old Clarke Hall has been transferred to a conspicuous place in the right downstairs passage way of Morgan Hall. It adds greatly to the building and gives the flavor of age. It will be remembered that Dr. Alva Woods was one of the first presidents of the University of Alabama; and it is entirely fitting that his tablet should be placed out of the now disused Clarke Hall and into the handsome new academic building where it can be seen by all students every day. Source: “Morgan Hall Receives New Coat of Calsomine,” The Crimson White, May 6, 1914, 2. Note: Calsomine is a form of whitewashing paint technique using a mixture of lime, water and sometimes glue to lighten an appearance. Morgan Hall is Scene of Impressive Ceremonies on Wednesday Afternoon. On Wednesday afternoon, when the University of Alabama honored with diplomas the old Confederate veterans who as cadets went out from the institution in the days of 1861-65, Morgan Hall was the scene of the most important as well as the most impressive and memorable of the sessions of the 18th annual convention of the Alabama division of the United Daughters of the Confederacy, which is convened at Tuscaloosa. And, after the imposing granite boulder which adorns the University campus in honor of those same valiant students who fought and died for their cause, and through the kindness of the Alabama Division U.D.C., was unveiled and fittingly dedicated, there closed one of the fullest days which the University of Alabama has experienced. A great throng packing auditorium and gallery to their limits and filling the aisles and vestibules, assembled in Morgan Hall at 4:30 o’clock to witness the ceremonies attending the awarding of the honorary diplomas to the thin and grizzly ranks of the boys of yesterday, the remnant of the Gray army of 1861-65 which came from New York to Mexico to receive the honor which they once sacrificed for their country. Mrs. L. M. Bashinsky, the president of the Alabama Division of the U.D.C. in a glowing tribute introduced the Reverend Joseph John, one of the cadets who resigned from the University to follow the stern pursuit of war, who pronounced the invocation. In a very touching manner did the Reverend Mr. John thank Providence for the care and mercy shown to our people during those bloody and terrible days of war and reconstruction. The Reverend Mr. John is now engaged evangelistic work in New York state. The subject of Mrs. Bashinsky’s address was “A Word to the Students of Today.” Very effectively did she picture the student of the University in the stirring war times. She dwelt upon his love to his country and his devotion to the cause, and showed how he sacrificed friends, alma mater, home, all, to join the ranks of those who were fighting for what they thought was right. She extolled him for his bravery and his loyalty; she praised him for his willingness to risk all for his convictions; and then she alluded to him as entirely worthy of emulation by the students of the present. To the now student she pointed out that his heritage from manly men whom he was permitted to call forbearers was one of honor and strength and truth. If at any time you may falter in your course of action, she said, turn your eyes to the past and behold again the lives and the conduct of the man who went out from this institution in the 60’s and take their lives for your example. During the afternoon, the University Glee Club sang several selections appropriate to the occasion. One of the most impressive of these was “Alabama, O Mother,” with words by F. G. Stickney. The club as a whole never sang to better advantage than on that day. One of the most interesting addresses of the occasion was that by Dr. John Massey, former president of the Alabama Conference Female College, situated at Tuskegee. Dr. Massey spoke absorbingly all through; but his greatest appeal came to his audience when he retailed some of the stirring scenes of the University campus in 1865 just at the time when the Yankee army was invading Tuscaloosa. How cadets behaved like veterans in the defense of Tuscaloosa against the army of General Croxton; how orderly was their retreat from Tuscaloosa to Marion; and how earnest was their enthusiasm to the end, was all repeated by him while the audience listened almost breathlessly. Many others of the details of the action at the University at the time were told in a charming manner. Hon. Sam Will John of Birmingham was the next speaker of the occasion. In introducing him, Mrs. Bashinsky said that he was a gentleman of the old school with all that that implied. Mr. John related some of the other details of the University, the cadets, and the war. He spoke of the wonderful discipline of the corps. The diplomas were delivered by Dr. George H. Denny, who first made an address on the subject “A Word to the Students of Yesterday.” Dr. Denny spoke of the traditions of the University of Alabama and said that an institution that has no traditions can appeal to the imagination of youth. He said that the University of Alabama wished to speak to the veterans of the Confederacy words of honor, faith, and congratulation. He begged each old soldier to accept the diploma as a testimonial of Alabama’s unchanging love and loyalty to those men who had so loved Alabama and been so loyal to here. The diplomas were then delivered to twenty-five old Confederates in person; the other one hundred were delivered to proxies or mailed to their owners by Dr. Eugene A. Smith. About one hundred and fifty were delivered in all. At a late hour, the assembly at Morgan Hall broke up and proceeded to the site of the boulder on the University campus, where the memorial was dedicated and tendered to the University of Alabama in honor of her sons who went to war, by Mrs. Bashinsky. After another able and eloquent speech by the U.D. C. president, the monolith was unveiled by Miss Cherokee Van de Graaff and Miss Hortense Rhodes, of Tuscaloosa. The monument was fittingly accepted by Dr. George H. Denny on the part of the University. A wreath was placed on the boulder by Miss Sara Marr McCormick. The Glee Club sang another song and thirteen co-eds representing the thirteen original states sang “The Bonny Blue Flag.” Hon. Sam Will John then gave the company roll call and the ceremonies were brought to an end by a benediction from Reverend Joseph John. Source: “Honorary Degrees Given to Old Confederate Cadets,” The Crimson White, May 13, 1914, 1. 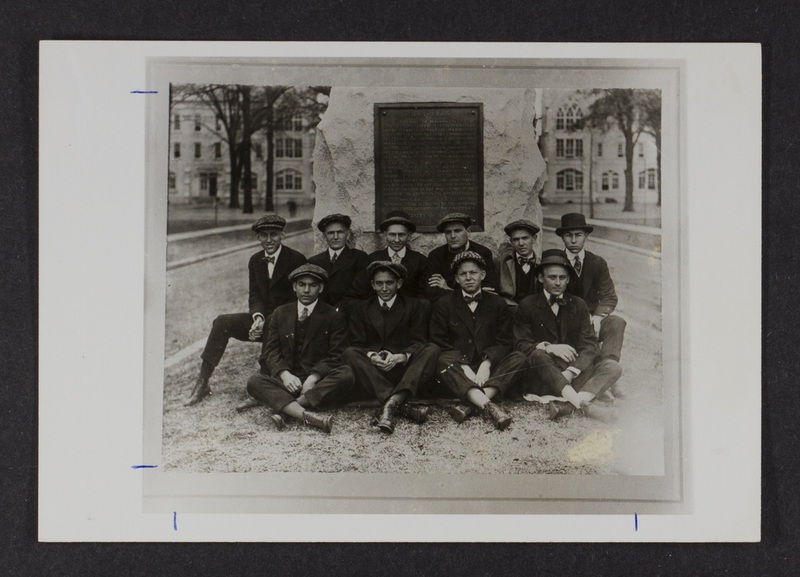 Recently, the members of the class of 1912 have constructed a concrete curb about the U.D.C. monument on the University campus. This is the memorial which that noted class leaves at the University. The curb is paraboloid [sic] in shape, being about 10 feet in length and 10 feet across. At the south end, is fixed a bronze slab upon which is the inscription. This curb was constructed by the members of the class of 1912. The plot inside the curb is ovalled [sic] over and sodded, and the appearance of the whole is that of beauty. The class of 1912 has distinguished itself. Source: “1912 Class Memorial,” The Crimson White, May 13, 1914, 1.